Looking for easy vegetables to grow in spring? 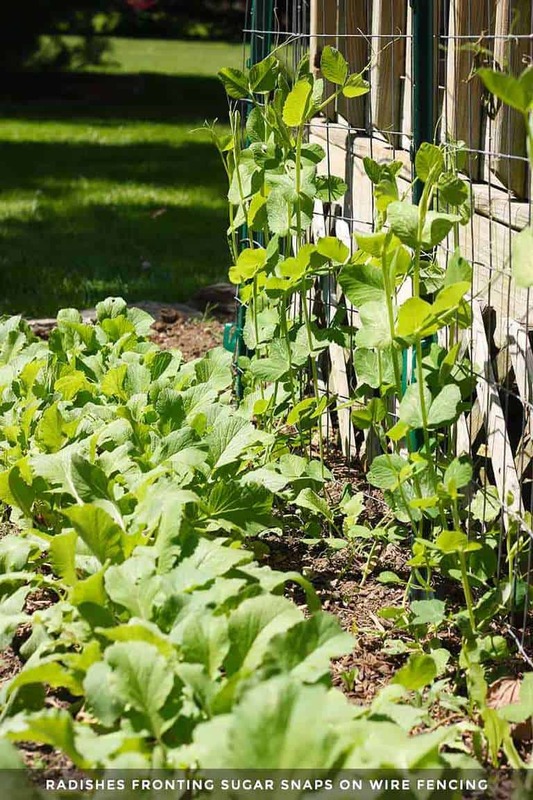 Ease into the new gardening season with three spring favorites that are easy to grow and taste great: peppery radishes, snappy peas, and tender leafy greens. As a decades-long home gardener, the thing I’ve come to appreciate the most about the seasons is that the weather wonderfully synchs up with the foods we’re craving in the moment. If you’re in the South/Southwest, it’s a little different for you, of course, because your growing season is extra long and hot. But for the rest of us, our four distinct seasons mean that different vegetables grow best at different times of the year. In the summer, we clamor for heirloom tomatoes, crisp cucumbers, and snappy bell peppers. Then fall rolls in and we start craving starchy carbs, like freshly-harvested sweet potatoes and butternut squash. By winter, we’re tossing carrots and leeks and parsnips — which can remain in the ground even as it freezes — into our slow-simmering soups and stews. And then finally, just when we can’t look another pudgy potato in the eye … spring! Spring garden staples are easy vegetables to grow, compared to their summer counterparts, such as tomatoes and celery. 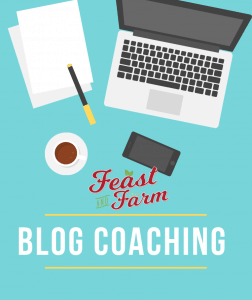 Quick and happy success is practically guaranteed, which is a great way to start off the new growing season. Many spring vegetables grow quickly — exactly what us garden-starved gardeners need after a long winter: fresh veggies, fast! 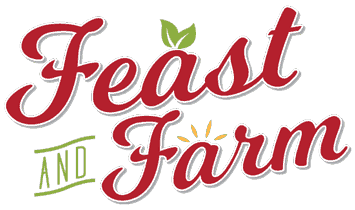 By the time we hit March, our taste buds are ready lighter, healthier food — the very kinds of vegetables that thrive in spring’s cool temperatures: broccoli, asparagus, cabbage, radishes, cauliflower, fennel, lettuces, peas, and leafy greens. 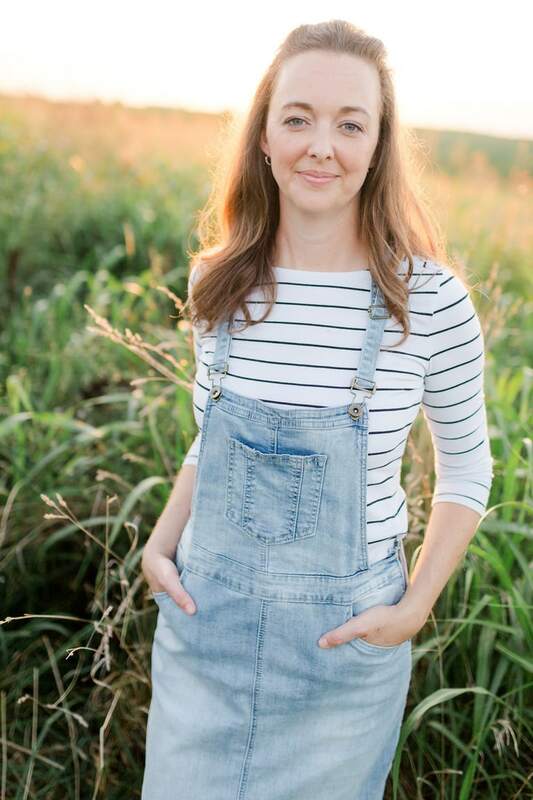 With a long, chilly winter just winding down, we vegetable growers are longing for green and champing at the bit to get out and play in the dirt! 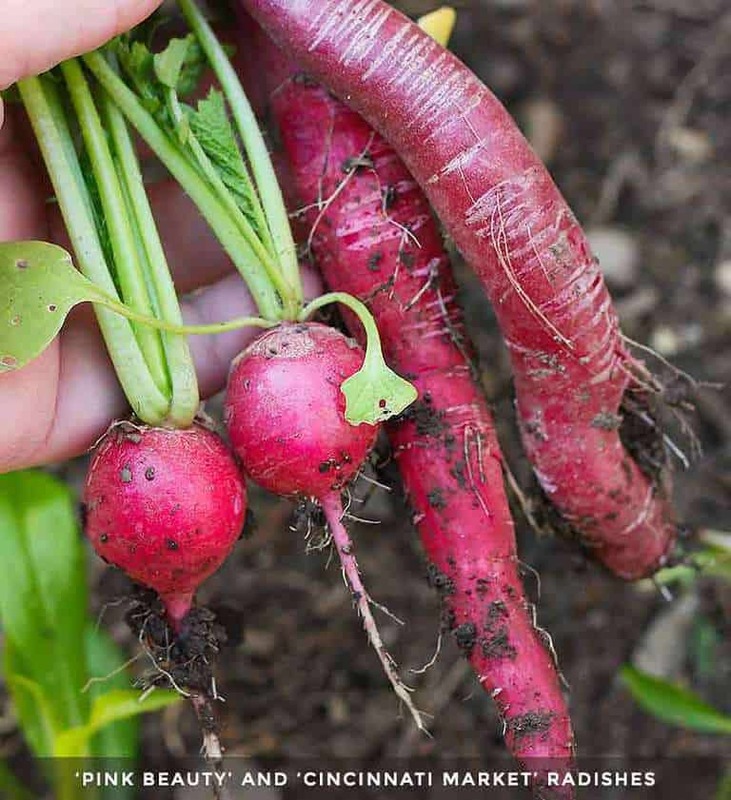 Radishes are my post-winter sanity savers: with their bright pops of root color, spicy bite, and abundant green foliage, these fast growing vegetables provide the immediate, homegrown-harvest-gratification I need coming out of a long, idle winter. They’re ready to harvest from seed in 3 to 7 weeks, depending on the variety. Bonus points: the greens are edible and nutritious! Radishes are so easy to grow that, if you get carried away with spring planting (as I usually do), you’ll have a bumper crop. But no worries: once you’ve sliced your fill of these garden jewels into fresh salads and slaws, you’ll want to move on to Rachel’s Easy Roasted Radishes, which demonstrates the magic that the oven has on vegetables. Roasting smooths out their peppery bite and turns them into a mild and tender side dish that the whole family will love! Purchase as: Seeds. Some farmers’ markets will be selling radish sprouts this time of year, but they’re likely to be a variety that’s best for tasty baby leaves, rather than the root. Radishes grow from seed so quickly that there’s no need to spend extra to purchase plants. Where to plant: Garden beds, raised beds, or large containers (think, long rectangular window boxes). Planting notes: Dig the soil deeply, and amend with fresh compost. Pat the soil flat and smooth. 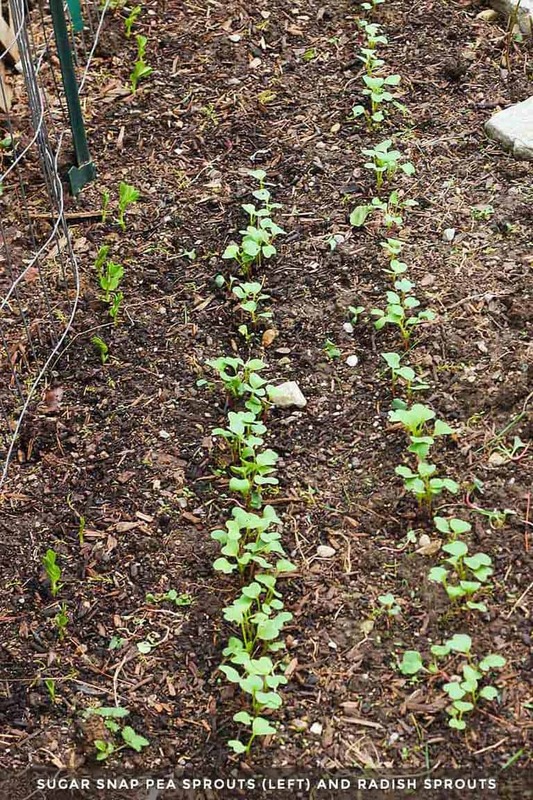 With radishes, you can take two seeding approaches: (1) seed closely together and later thin the seedlings to 3″ apart, or (2) seed 3″ apart and take the chance that some seeds will not germinate. In either case, plant rows at least a foot apart, with the seeds 1/2″ deep. Firm soil over the top of them, and water. Round or globe: the standard in radishes. They’re the earliest to mature and are available in a range of colors from white to pink to red to purple. If you’re feeling adventurous, try the black Spanish radish, which has a surprisingly uniform black skin surrounding white flesh (stunning!). French Breakfast: one of my all-around favorites. Oblong in shape and deep pink with a white tip, they’re milder than most radishes and make a tasty and attractive addition to crudites, fresh salads, and even fish tacos. Long and semi-long: carrot-shaped radishes that slice up neatly for salads. Red Meat/”Watermelon”: a truly beautiful specimen with watermelon coloring: pale green skin with a bright pink flesh. Gorgeous on the plate! Pea pods, with their crunchy sweetness, liven up salads and spring pasta dishes, and are ready to harvest in about 60 days. Note that the entire plant is edible and delicious, even the flowers and curly tendrils, which are beautiful as garnishes. Peas are among my favorite of the easy vegetables to grow in spring–you’ll be surprised how foolproof they are. Where to plant: Garden beds, raised beds, or large containers. Special equipment: For all but the shortest varieties, you’ll need a trellis or fencing to support the vines as they grow. No need to invest in anything fancy (unless you want to). Pea plants are lightweight, so they don’t need weight support as much as vertical guidance. 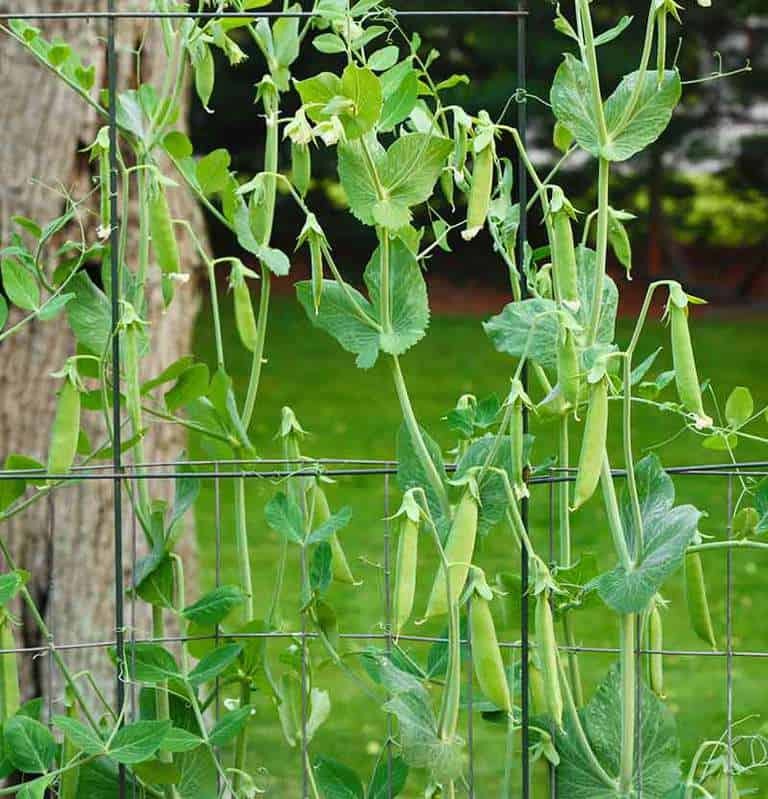 Peas send out thin tendrils that latch on to anything they can twist around, including other plants and each other, which means even simple stakes with twine strung between them will work great. Plan on a height of 5 to 6′. Trellising keeps the tender pods off the ground, preventing rot and minimizing diseases from taking hold. If planting multiple rows, space them such that you can move easily between them for harvest (e.g., 5 or 6′). Dig the soil deeply, and amend with fresh compost. Pat the soil flat and smooth. Sow seeds 1″ deep and 2″ apart. No need to thin, as the vines grow straight and narrow, and it’s no problem as they branch out in their upper heights. 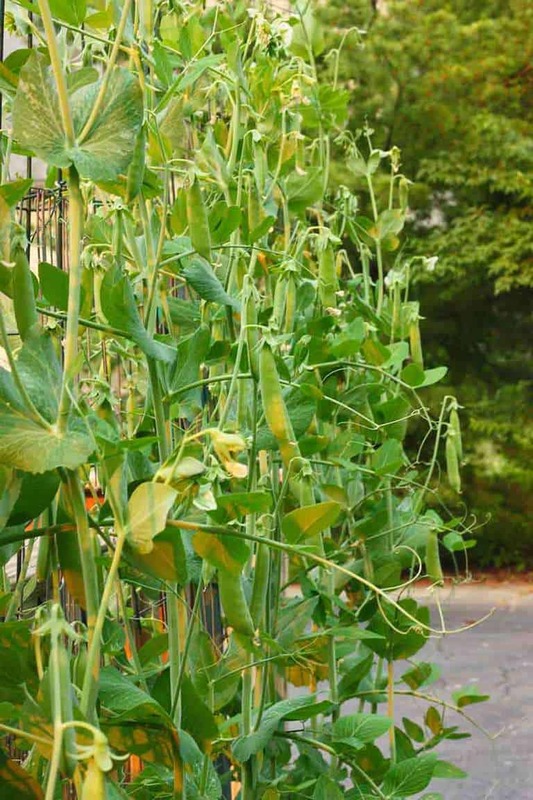 Sugar Snaps: if destringing peas is a bother, be sure to look for stringless varieties bred for sweetness. Snow Peas: flatter pods with smaller seeds, snow peas come in a variety of colors, including purple, yellow, and traditional green. The non-green varieties are best used for raw preparations, such as salads or vegetable trays, as they’ll lose their colors when cooked. While radishes energize my gardening spirit, growing greens lures me fully into the addiction of easy vegetables to grow in spring. As a diehard salad lover, there’s nothing I appreciate more than popping out to the deck to pick fresh lettuces and spinach for dinner. Pro tip for growing greens: unless you’re making a huge salad for a crowd, there’s absolutely no reason to harvest the entire head at once. You can pick only as many leaves as you need, allowing the rest of the plant to continue leaf production until hot weather overcomes it. If you plan on growing lots of greens this year (yay!) and will need more ways to use up your lettuce crop, check out Rachel’s southern classic Wilted Lettuce Salad. Never heard of such a thing? Let’s just say that there are bacon drippings involved, and leave the rest for you to discover! Purchase as: Seeds or transplants. 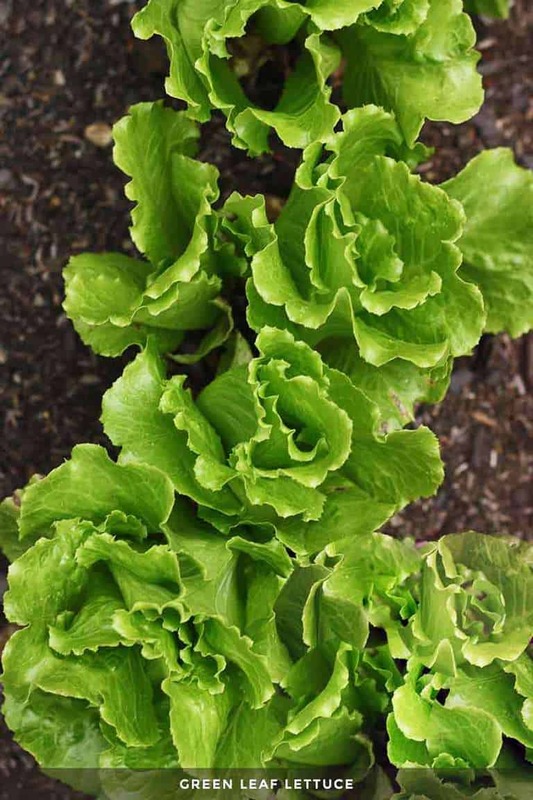 Planting notes: Lettuces have shallow but wide root systems, and require soil that drains well. Sow seeds at least 12″ apart (and 1/4″ deep), as the plants will grow larger than you expect. Where to plant: Garden beds, raised beds, or large containers. I have a waist-high garden bench where I grow all of my greens. Special equipment: Tender salad greens cannot withstand hot weather and will quickly bolt (flower and go to seed), but you can extend their season by a few weeks with shade cloth. This is completely optional, of course. Construct a “roof” over the lettuces to filter the sun during the hottest part of the day. Note that the cloth should be permeable to allow rainwater to pass through. Garden centers sell rolls of material for this specific purpose, and it works great. I have a permanent shade structure over my greens garden bench, and one roll of cloth has lasted years. Romaine: The standard bearer of green salads, romaine grows sturdy and strong through cool weather. Easily grown from seed, many garden centers also sell transplants early in spring, though, to give you a jump on harvest. Red and green leaf lettuces: Tender and fresh, these ruffly leaf lettuces are always part of my salad mixes. Like romaine, they should be readily available as transplants from your local garden center. Spinach: This must-have green has so many uses beyond salad that it wins an oversized chunk of my garden every year. Look for slow-bolting varieties, especially if you live in an area, as I do, that gets unusually hot weather in May (we often hit the 90’s around Memorial Day weekend, before it cools once again heading into June). 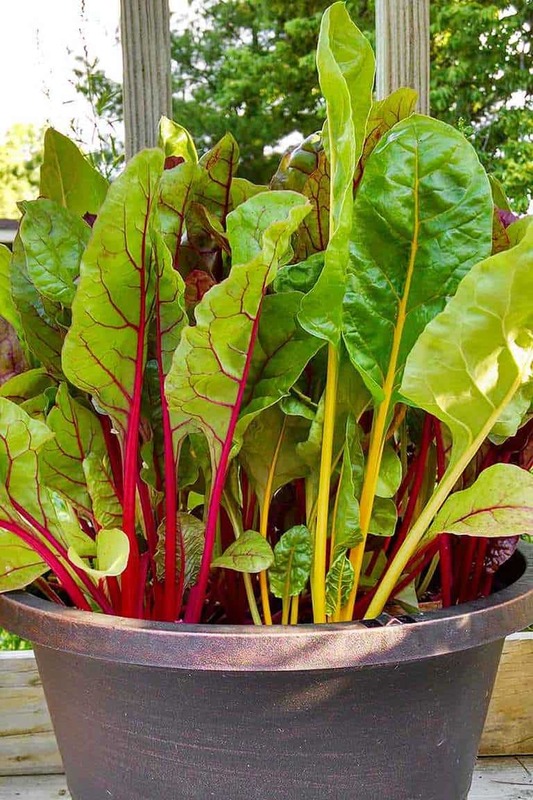 Swiss Chard: Although not strictly a spring green, you can start Swiss chard in the spring and, with frequent harvesting, enjoy the crop all summer long. Baby leaves can be eaten raw, while mature leaves withstand sautéing. Some seed packs include varieties with a rainbow of stem colors, which makes for a beautiful display all season long. Kale: Curly leaf varieties should be readily available at the nursery. Also try the lacinato variety (a.k.a. 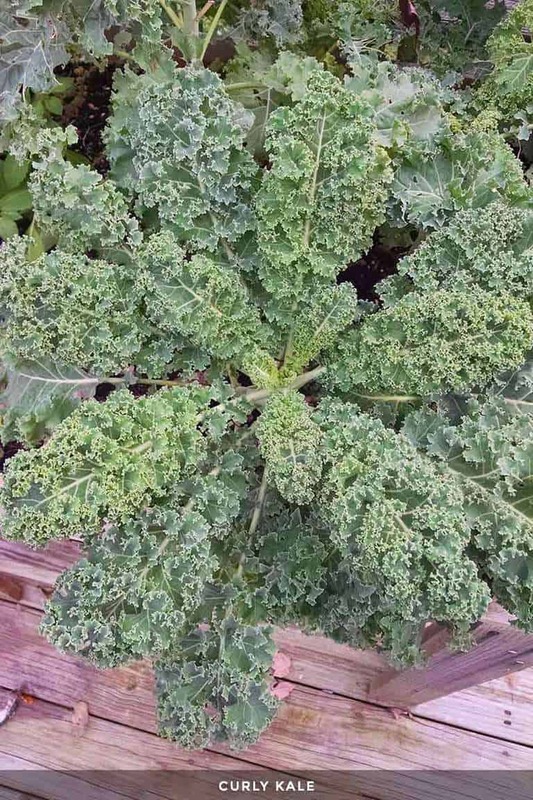 Toscano or “dinosaur” kale). It’s straight and narrow savoy leaves are sweet and tender enough to consume raw, but hardy enough for soups and sautés. Lacinato will grow all summer long except in the hottest of climates. Other recommended spring cultivars to try: arugula and red mustard. Mustard has the advantage of growing big, wonderfully tasty and spicy leaves, plus you can produce your own mustard seeds by letting the plant flower and harvesting the seed pods later in the summer, after they’ve dried on the stalk. Now’s the perfect time to start your spring garden (and plan your summer vegetables) — I hope you’ll give these easy vegetables to grow a try this year!